Understand: we help organizations build a shared vision on the basis of deep customer insights and organisational culture. Focus: we help companies combine this vision with commercial and strategic opportunities, to build a roadmap of innovative products and services. Design: we help companies design the products, services and customer experience that make this growth tangible. Implement: we help companies orchestrate the touch points and implement the products and services we helped design in the third stage. An important part of our job is not only to find the right answer, but first to find the right question. Helping our client discover the exact nature of the challenge they are facing or the problem they are solving is an important part of the value we offer. 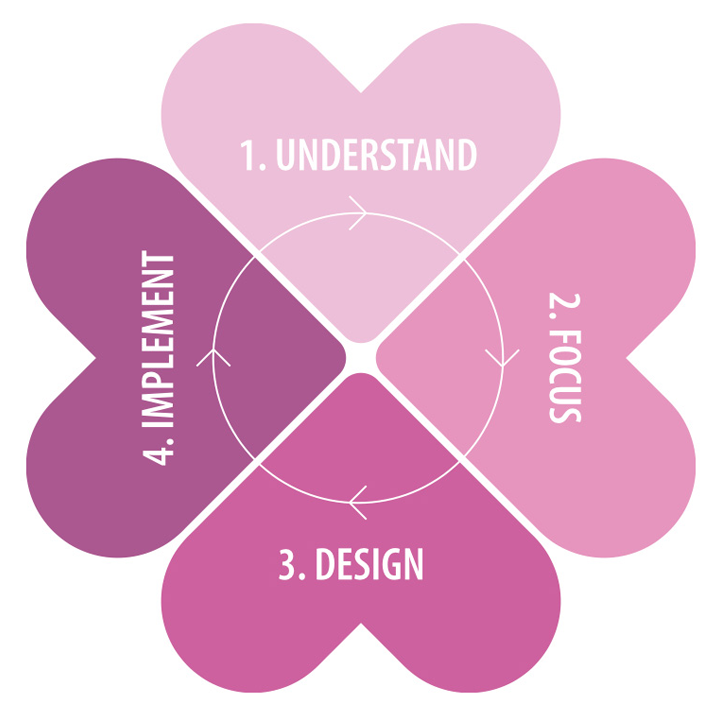 As designers we are very comfortable with this fuzzy stage of the innovation process where we unravel the issue at hand and explore the questions behind the initial question. Our processes are iterative, non linear and sometimes improvised. We don’t claim to have a one size fits all solution, and we don’t claim there’s an easy way out of complexity. Also, we dare to take a step back if a certain route doesn’t work and we keep testing and refining solutions. This requires courageous clients who realise that linear processes belong to the industrial age. This means we firmly and fundamentally believe that things can be better. It also means that we like to try things out and we are not afraid to fail. When you’ve tried something, you’re already halfway to solving it. A prototype, or an idea, to us is a new way of asking the question, not necessarily a new answer. It asks: ‘would this work? Is this a potential solution area? Is this a right way to look at the question? Optimism and curiosity has led us to numerous solutions where others thought everything had been tried. As designers we’ve always worked for and with real human beings. Not only stats, not only market segments or personas, but real humans of flesh and blood. We’ve discovered that our ‘design empathy’, as we like to call it, brings tremendous value to our clients. Our understanding for people has benefits in two distinct but overlapping areas: we help our clients get much closer to their customers by engaging them in design research, context mapping, diary studies, house visits etc etc. And we help our clients create a much stronger internal bond by making people from different backgrounds, divisions, functions and levels, work together around shared themes like customer understanding and vision.